As if you wanted another theme to look at all of a sudden, here is one. 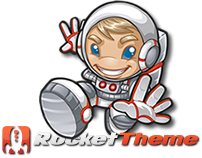 And this one is from RocketTheme and the first time I saw it, I thought of a car. Don't ask me why, but I have just woken up after a few beers last night, but I think it was because of the badge in the middle. I'm also seeing stuff right now and one of those things I'm seeing is RokSprocket and I really do like it. It just works with any type of content you have and it means you can get rid of quite a few others. To say I'm falling in love with RokSprocket would be a lie, but I'm thinking about a cheeky bit on the side.